"This is what I have seen in my dreams, this is the country for me." 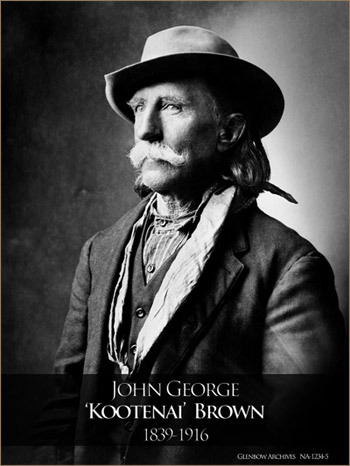 No single person is so associated with Waterton more than John George “Kootenai” Brown. Born in Ireland in 1839 but orphaned because of the passing of both his parents, he was raised and educated in his grandmother’s house. In 1857, as a young man, he secured an officer’s commission in the British military. After serving for three years, including a stint in British India, J.G. Brown left the military and came to Canada in 1861, lured by the promise of gold in the great Cariboo gold rush. Prospecting in British Columbia did not go well for Brown and so, for a time, he worked as a police constable; however, the attraction of gold lured him once again and with four other companions he made his way through the mountains setting out for Fort Edmonton. On his journey to Fort Edmonton, Brown came through the Boundary (South Kootenay) Pass and saw for the first time what was then known as the Kootenay Lakes (now of course known as the Waterton Lakes). John George Brown fell in love with the area, and though he continued on his journey, he promised himself that he would come back and settle there. After leaving the area, Brown was wounded in a skirmish with a Blackfoot war party. This skirmish and an already fractious difference with his companions split their group up before ever reaching Fort Edmonton. Brown instead continued on his way to Saskatchewan where he wintered with the Métis before continuing on to Winnipeg early in 1866. From Winnipeg, Brown moved on to the Dakota and Montana territories in the United States where he found work as a Pony Express mail carrier and eventually worked for the US military as a guide. In 1868 he was captured and almost killed by the famous Sioux chief Sitting Bull who was fighting the presence of the US army in the area. Brown escaped that encounter and from there went on to join a Métis community to which his first wife, Olive, belonged. For a time, Brown hunted the Buffalo, taking part in the last great Buffalo hunts, and then he turned to hunting and poisoning wolves to turn a profit in selling their pelts. These doings would doubtless have rankled Brown later in life when conservation became such an integral part of his vision. In 1877, in true Wild West fashion, Brown killed a man in a fight in Fort Benton, Montana. In jail for the murder, and despairing of his escape, Brown unsuccessfully attempted suicide. He was later acquitted of the crime and released, later in life remarking that the best words in the English language were, “Not Guilty”. Remembering his earlier resolve to settle on the Kootenay Lakes, Brown took his wife and their children and settled in a cabin between the Upper and Lower Lake. In this time, Brown hunted and fished, explored the backcountry of Waterton and worked as a packer and guide for the North West Mounted Police. Around 1885 Brown’s wife died; within a few years, Brown remarried to a Cree woman named Cheepaythaquakasoon. In 1898 Brown was employed as a packer by the Canadian Pacific Railway as it made its way through the Crowsnest Pass. Western Canada became more accessible because of the railway and with that accessibility came many new visitors to the region. The influx of people alarmed Brown and along with other area residents, they voiced their concern to federal politicians about the impact this was having on the uniqueness of the region. On May 30th, 1895 the federal government set aside a large piece of land as the Kootenay Lakes Forest Reserve. In 1901 Kootenai Brown became the Kootenay Lakes Fishery Officer and in his reports he consistently mentioned the need for conservation efforts, particularly as a short lived oil boom in Waterton was occurring. In 1910 he was promoted to Forest Ranger and four years later, in great part because of his strong urging, the Kootenay Lakes Forest Reserve was renamed Waterton Lakes National Park. John George “Kootenai” Brown passed away in 1916. He was buried on the Western shore of the Lower Waterton Lake beside his first wife, Olive, later to be joined by his second wife at her passing.